SWELL1 (LRRC8A) is the only essential subunit of the Volume Regulated Anion Channel (VRAC), which regulates cellular volume homeostasis and is activated by hypotonic solutions. SWELL1, together with four other LRRC8 family members, potentially forms a vastly heterogeneous cohort of VRAC channels with different properties; however, SWELL1 alone is also functional. Here, we report a high-resolution cryo-electron microscopy structure of full-length human homo-hexameric SWELL1. The structure reveals a trimer of dimers assembly with symmetry mismatch between the pore-forming domain and the cytosolic leucine-rich repeat (LRR) domains. Importantly, mutational analysis demonstrates that a charged residue at the narrowest constriction of the homomeric channel is an important pore determinant of heteromeric VRAC. Additionally, a mutation in the flexible N-terminal portion of SWELL1 affects pore properties, suggesting a putative link between intracellular structures and channel regulation. This structure provides a scaffold for further dissecting the heterogeneity and mechanism of activation of VRAC. Every cell needs to regulate its internal volume or it will burst. Most of a cell’s volume is a watery mixture of salts, proteins and other molecules. A cell can take in more water from its surroundings, diluting this mixture and causing the cell to expand. If a cell starts to take up too much water, it will open channel proteins in its outer membrane called volume regulated anion channels (or VRACs for short). An open VRAC allows negatively charged ions to leave the cell, and in the process causes water to leave the cell too. This relieves the pressure inside the cell, and the cell starts to shrink. The structure of a VRAC is thought to contain six subunits, and most include at least two different kinds of subunit. Some of the subunits must be a protein called SWELL1 (which is also known as LRRC8A). The other subunits can be any of four similar proteins from the same protein family. Since a VRAC can contain additional subunits drawing from this pool of five proteins, many structures are possible. But it remains unclear exactly how the structure of a VRAC allows it to sense and regulate the volume of a cell. This is partly because scientists do not have enough information about the architecture of this protein to understand how it might work. Using electron microscopes, Kefauver et al. have now captured detailed images of a VRAC composed entirely of human SWELL1 proteins. The overall structure of VRAC resembles a six-legged jellyfish, with a pore on the cell’s exterior passing through a constricted dome followed by three pairs of arms that extend into the cell’s interior. Given the observed structure, Kefauver et al. speculate that the arms of the SWELL1 proteins sense salt concentrations within the cell (to tell if its become diluted by an influx of water) and then interact with the rest of the channel. In response to these interactions, the domed part of the VRAC constricts or dilates to help regulate the cell’s volume. Molecular biologists can now use these structural details to further study the fundamentals behind how cells regulate their volume. This model will also improve scientific understanding of how diverse VRAC structures differ in their responses to changes in pressure within cells. VRAC is a ubiquitously expressed mammalian anion channel implicated in diverse physiological processes including volume regulation, cell proliferation, release of excitatory amino acids, and apoptosis (Hyzinski-García et al., 2014; Nilius et al., 1997; Pedersen et al., 2016). It is suggested to play a role in a variety of human diseases including stroke, diabetes, and cancer (Hyzinski-García et al., 2014; Planells-Cases et al., 2015; Zhang et al., 2017). A causative link has been established between a chromosomal translocation in the SWELL1 (LRRC8A) gene and a human B cell deficiency disease, agammaglobulinemia (Sawada et al., 2003). Previous studies have shown that SWELL1 is required for VRAC activity, and that the presence of other LRRC8 subunits dictates functional characteristics of VRAC, including pore properties (Qiu et al., 2014; Syeda et al., 2016; Voss et al., 2014). While SWELL1 and at least one other LRRC8 subunit are required for canonical whole-cell VRAC currents, purified homomers of SWELL1 reconstituted in lipid bilayers are activated by osmotic stimuli and blocked by VRAC antagonist, DCPIB (Syeda et al., 2016). Interestingly, CRISPR-engineered HeLa cells lacking all LRRC8 subunits (LRRC8-/- HeLa cells) exhibited very small but significant DCPIB-sensitive hypotonicity-induced currents after SWELL1 overexpression (Figure 1—figure supplement 1), supporting previous bilayer results. Since the number and composition of functional native oligomeric assemblies remains unknown, we decided to first elucidate the structure of SWELL1 homomers. To produce homomeric SWELL1, human SWELL1-FLAG was recombinantly expressed in LRRC8(B,C,D,E)-/- HEK293-F suspension cells, then solubilized in 1% decyl maltose neopentyl glycol (DMNG) detergent, followed by purification and exchange into 0.05% digitonin for structure determination by cryo-EM (Figure 1—figure supplement 2). Image analysis and reconstruction yielded a ~4 Å resolution map that was used to build a molecular model of SWELL1 (Figure 1—figure supplements 3–4, Supplementary file 1). SWELL1 is organized as a hexameric trimer of dimers with a four-layer domain architecture and an overall jellyfish-like shape (Figure 1A). The transmembrane (TM) and extracellular domains (ECDs) surround the central pore axis, and share a previously unappreciated structural homology with the connexin (Maeda et al., 2009) and innexin (Oshima et al., 2016) gap junction channels (Figure 1—figure supplement 5A–D). The ECD is composed of two extracellular loops (ECL1 and ECL2) that are stabilized by three disulfide bonds (Figure 1B–C and Figure 1—figure supplement 5E–F). ECL1 contains one strand of a small beta-sheet and a helix (ECH) that faces the center of the ECD while ECL2 contains two additional antiparallel beta strands of the beta-sheet that faces the outside of the ECD. Each subunit contains four TM helices (TM1-4). TM1 lies closest to the central pore axis and is tethered to a short N-terminal coil (NTC) that is parallel to the inner leaflet of the membrane. In the cytosol, the intracellular linker domains (ILD) create a tightly packed network of helices connecting the channel pore to the LRR domains. Each ILD is composed of two-four helices from the TM2-TM3 cytoplasmic loop (LH1-4), and five helices from the TM4-LRR linker (LH5-9) (Figure 1C). Each protomer terminates in 15–16 LRRs which form a prototypical solenoid LRR fold (Figure 1B–C). LRRs from the six protomers dimerize into three pairs, which interact to form a Celtic knot-like assembly (Figure 1A). Overall architecture of homomeric SWELL1. (A) Cryo-EM reconstruction of SWELL1 homohexamer viewed from the membrane plane highlighting a dimer pair (top left, red and pink subunits) and an interface between dimers (top right, pink and green subunits), from the extracellular side (bottom left), and from the cytosolic side (bottom right). (B) Detailed view of SWELL1 ‘inner’ protomer. (C) Topology diagram denoting secondary structural elements. Dashed lines indicate unresolved regions on both protomers in a dimer pair, while dashed shape borders indicate regions that are only resolved on one protomer. Perhaps the most striking architectural feature of VRAC is the symmetry mismatch between the cytosolic LRR domains and the pore-forming domains of the channel, despite its homo-hexameric assembly (Figure 2). 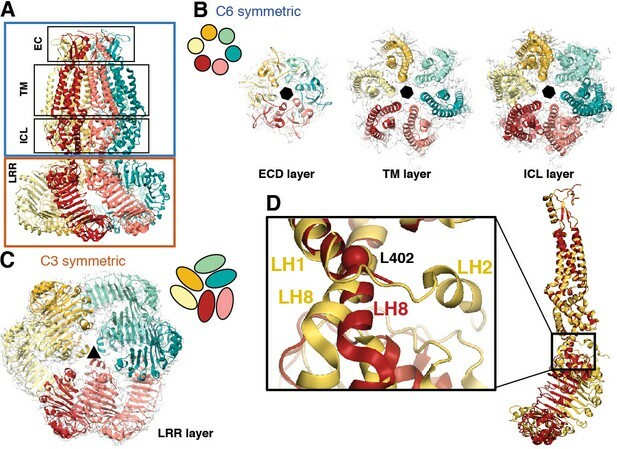 The ECDs, TMs, and ILDs all share the same 6-fold symmetric arrangement (Figure 2B); however, in the cytosol, LRR domains dimerize in a parallel fashion with each LRR at either a 10 or −20° offset relative to the rest of its protomer, producing a 3-fold symmetric trimer of dimers (Figure 2C). The nonequivalence between identical subunits arises from a hinge around the conserved residue L402 in a helix of the TM4-LRR linker (Figure 2D and Figure 1—Figure supplements 6 and 7). This hinge allows the LRR domains to shift as rigid bodies, producing sufficient flexibility for them to interface at their edges via several charged residues (Figures 2D and 3A). As a result, the helical C-termini of the two subunits in a dimer pair make two different sets of interactions with the neighboring LRR (Figure 3B). Focused 3D classification of the LRR domains revealed several arrangements of LRRs suggesting that flexibility of the LRR domains may play a functional role in channel gating (Figure 2—figure supplement 1), similar to the intracellular domains of the CorA magnesium channel (Matthies et al., 2016). 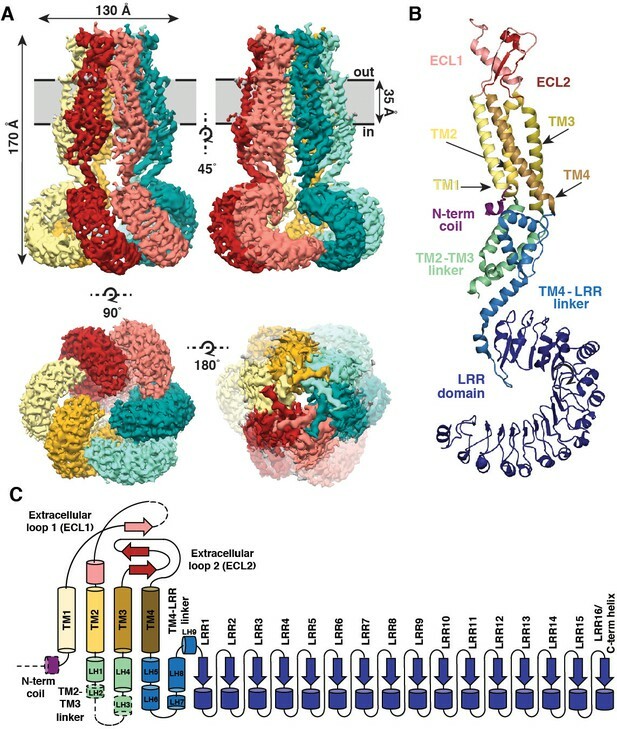 Interestingly, the outer LRR subunit in the dimer exhibits helical density in the C-terminal half of the TM2-TM3 linker that rests on top of the outer protomer’s LRR domain, adding an additional layer of intricacy to the network of cytosolic interactions (Figure 1—figure supplement 5A–B). Symmetry mismatch is also observed in the homotetrameric AMPA receptor GluA2, which similarly forms local dimers in different domain layers (Sobolevsky et al., 2009). Furthermore, the dimer-of-dimers topology of homotetrameric AMPA-subtype ionotropic glutamate receptors (iGluRs) defines the subunit organization of di- and tri-heteromeric NMDA-subtype iGluR structures (Karakas and Furukawa, 2014; Lee et al., 2014; Lü et al., 2017). By analogy, we speculate that the trimer-of-dimers assembly of SWELL1 is recapitulated in, and influences the composition of, heteromeric VRACs. Subunit arrangement exhibits symmetry mismatch. (A) SWELL1 model viewed from the membrane plane with domain layers viewed perpendicular to the symmetry axis. (B–C) Domain layers viewed from the top of the channel grouped according to shared symmetry with simple schematic to demonstrate subunit arrangement. (B) From left to right: extracellular domain layer (EC), transmembrane domain layer (TM), and intracellular linker domain layer (ICL) all share the same 6-fold rotation symmetry axis (black hexagon). (C) The LRR domain layer has 3-fold rotational symmetry (black triangle), resulting from parallel pairing of three sets of LRR domains. (D) Asymmetry in LRR pairing arises from a hinge at L402 on LH8 that allows rotation of the LRR domain as a rigid body in a dimer pair. The first two TM domains of the inner (red) and outer (yellow) subunits are aligned to one another using the PyMOL align function. LRRs interact via charged residues at dimer interfaces and C-termini. (A) One dimer of SWELL1 subunits. Charged residues both of opposite and similar charges face each other in the interface between the two LRR domains (insets, top middle and bottom left; blue spheres are positively charged residues (Arg, Lys, and His), red spheres are negatively charged residues (Asp and Glu)). (B) C-termini of the two protomers in a dimer interact with regions of the neighboring LRR domain. Two of three ‘outer’ subunits are removed for clarity. ‘Inner’ subunits may be able to coordinate with one another via a triad of charged residues (E800) at their C-termini (inset, dashed border, top right), while the C-termini of the ‘outer subunit’ may interact with the edge of the neighboring outer subunit via charged residues R688 on LRR12 and/or K732 on LRR13 (inset, dashed blue border, bottom right). Unlike other ion channels, there is little domain swapping between the subunits of the pore-forming domains of the SWELL1 channel. The individual helical bundles are loosely packed with one another and lined with hydrophobic residues. The inter-protomer space may be occupied by hydrophobic membrane components like lipid or cholesterol that might be important for channel assembly or lipid signaling. Such densities are observed in the inter-subunit space in innexin-6 and have been proposed to have a stabilizing role in the conformation of the helix bundles (Oshima et al., 2016). At the upper faces of the extracellular domains, on mostly flexible loops, resides a three residue KYD motif previously shown to be involved in voltage-dependent inactivation and selectivity (Ullrich et al., 2016); interestingly, KYD extends laterally towards the neighboring subunit (Figure 4—figure supplement 1), suggesting that subunit interactions in this region contribute to these channel properties. The ECDs, TMs, and ILDs of all six subunits contribute to the ion-conducting pore (Figure 4A–B). Below that, windows of 35 by 40 Å between LRR dimer pairs are sufficiently large to allow ions and osmolytes to freely pass. In the extracellular domain, 25 Å above the membrane, a ring of arginines (R103) at the N-terminal tip of the extracellular helix forms the narrowest constriction in the channel structure (Figure 4A–C). We hypothesized that these arginines, only conserved between SWELL1 and the LRRC8B subunit (R99) (Figure 1—figure supplement 6), might directly interact with permeant anions. To test this hypothesis, we mutated positively-charged R103 to phenylalanine, and determined whether ion selectivity was altered in SWELL1-R103F + LRRC8C heteromeric channels heterologously expressed in HeLa LRRC8(A,B,C,D,E)-/- cells. We determined the reversal potential (Vrev) for hypotonicity-induced Cl- currents mediated by SWELL1-R103F + LRRC8C channels. The Vrev of currents mediated by SWELL1-R103F + LRRC8C was significantly reduced compared to wildtype channels, indicating that the channels are less selective for Cl- (Figure 4D) (Ackerman et al., 1994; Jackson and Strange, 1995; Tsumura et al., 1996). Furthermore, extracellular ATP at concentrations that block ~75% of wildtype VRAC currents was ineffective on channels containing R103F (Figure 4E and Figure 4—figure supplement 1). Therefore, R103 is a critical residue within SWELL1 that impacts ion selectivity as well as pore block of heteromeric VRAC channels. Ion pore structure and characterization of channels with mutations at pore-contributing residues R103 and T5. (A) Cartoon model of the SWELL1 pore, with two subunits removed for clarity. A surface representation of the radial distance between the protein surface and the pore axis is shown in grey. Pore-facing residues R103, T48 and T44, and N-terminal coil (NTC) are labeled in pink. (B) Graph of van der Waals radii of the pore, plotted against distance along the pore axis. Locations of residues R103, T48, T44, and NTC are labeled along 2D plot. Grey box covers potential area the N-terminus might occupy. (C) Electrostatic surface potential of channel pore, viewed by vertical cross-section. Narrow constriction on the extracellular side of the channel is formed by a ring of R103 residues (yellow arrows). Calculated using APBS implemented by Pymol2.0 with potentials ranging from −10 kT (red) to +10 kT (blue). (D–E) Cells expressing heteromeric VRACs composed of mutant SWELL1-R103F + LRRC8C show reduced chloride selectivity and insensitivity to external ATP block. (D) For highly Cl- selective channels, the voltage at which there is no net current (Vrev) is close to the equilibrium potential for Cl- (in these experiments ECl = +9.75 mV; indicated by the dotted line). Vrev of currents mediated by SWELL1-R103F-containing channels (orange bar; +4.6 ± 1.0 mV (mean ± s.e.m., n = 6 cells from 3 separate transfections)) is significantly reduced compared to WT (blue bar; +8.8 ± 0.8 mV (n = 13 from 6 separate transfections); p = 0.003, Student’s t-test. (E) The percent block of whole cell leak subtracted hypotonic-induced currents by extracellular applied Na2ATP (2 mM) was determined at +100 mV. Outward WT SWELL1 + LRRC8C-mediated currents are blocked 72 ± 2% (mean ± s.e.m., n = 7 from 4 separate transfections; blue bar). Outward currents mediated by SWELL1-R103 + LRRC8C are not blocked by extracellular ATP (2 ± 3% (mean ± s.e.m., n = 5 from 3 separate transfections; orange bar); this difference is highly significant (p = 5.4e^-8, Student’s t-test). (F) Detailed view of coordination of NTC (purple). The NTC makes intrasubunit contacts with V157 on LH1 and a conserved Y382 at the kink between LH6 and LH7 of the TM4-LRR linker. Additionally, P22 of the NTC makes an intersubunit contact with a conserved P147 at the kink between TM2 and the TM2-TM3 linker of the neighboring subunit. (G–H) SWELL1-T5 is close to or part of the pore. (G) A cysteine mutation at SWELL1-T5 confers sensitivity to the polar MTS reagent MTSES applied extracellularly; maximum percent block of T5C-containing channels (red bars) by 3.33 mM MTSES was 74.2 ± 7.7% at −100 mV (left) and 50.4 ± 9.5% at +100 mV (right) (n = 5; mean ± s.e.m. ; four separate transfections). The unmodifiable T5R-containing heteromeric channels (blue bars) are unaffected (n = 3 from 3 separate transfections; p=0.0009 at −100 mV and p=0.010 at +100 mV, Student’s t-test). (H) Relative permeability PI/PCl is enhanced by the T5R mutation. Reversal potentials in iodide (left) and chloride (right) 230 mOsm/kg solutions are shown for the number of cells from 3 to 7 separate transfections (WT-, T5C- and T5R-expressing cells were from 6, 4, and 3 transfections, respectively, in the Cl- condition, and 3, 3, and 3 transfections, respectively, in the I- condition). The Vrev of currents mediated by SWELL1-T5R + LRRC8C (blue) in I- solution was significantly more negative than either WT- (black) or T5C (red)-containing channels (p=0.0088 (**) and 0.0047 (***), respectively. Table: PI/PCl is shown as means with lower and upper 95% confidence intervals. Within the pore, constrictions are observed at pore-facing residues T44 and T48 (Figure 4A–B). Interestingly, we had previously identified residue T44 via the substituted cysteine accessibility method (SCAM) on heteromeric channels as likely to be at or near the pore (Qiu et al., 2014). Near the bottom of the pore cavity, a constriction at the intracellular face of the membrane corresponds to a short N-terminal coil (NTC) sitting parallel to the inner leaflet of the membrane. The first 14 residues of the N-terminus of the channel are not resolved in the cryo-EM density, presumably due to flexibility. 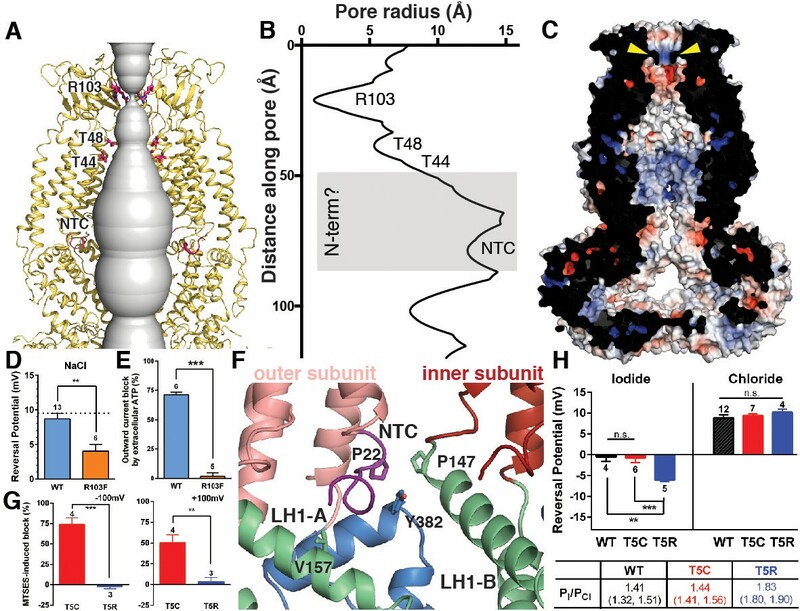 The absence of these residues is conspicuous; in the Cx26 and innexin-6 structures, an N-terminal helix forms a pore funnel structure that is the narrowest constriction in the structures of these channels and is thought to contribute to trafficking, selectivity, and gating (Kyle et al., 2008; Maeda et al., 2009; Oshima, 2014; Oshima et al., 2016). In our reconstruction, the short portion of the NTC that is resolved is highly coordinated by cytosolic domains and positioned to respond to conformational changes in the cytosolic domains of one protomer, as well as movements of the neighboring protomer (Figure 4F). Due to the similarities in pore structure between VRAC and connexin/innexin (Figure 1—figure supplement 5), we conducted functional assays to interrogate the role of the NTC in VRAC. We focused on residue T5 because the homologous residue is involved in stabilizing the pore funnel through a hydrogen bonding network in the Cx26 structure (Maeda et al., 2009). We made the mutation T5C to test whether extracellular addition of the negatively-charged, membrane-impermeable thiol-reactive reagent, 2-sulfonatoethyl methanethiosulfonate (MTSES), could alter VRAC activity in heteromeric channels composed of SWELL1-T5C + LRRC8C in HeLa LRRC8(A,B,C,D,E)-/- cells via cysteine modification. While MTSES has no effect on wildtype heteromeric channels (Qiu et al., 2014) or channels containing SWELL1-T5R (Figure 4G), whole-cell currents mediated by SWELL1-T5C + LRRC8C are strongly suppressed upon the addition of MTSES, suggesting that T5C is part of a constriction narrow enough to block the pore upon covalent modification by MTSES (Figure 4G and Figure 4—figure supplement 2). We next determined the role of T5 in anion selectivity. Although SWELL1-T5C-containing channels have similar relative permeability to wildtype, SWELL1-T5R-containing channels are significantly more selective to iodide compared to chloride, confirming that this residue is close to or part of the channel pore (Figure 4H and Figure 4—figure supplement 2). Thus, the unresolved portion of the N-terminus plays a role in pore constriction in native channels composed of SWELL1 and LRRC8C. Its absence in our structure is likely due to either the high flexibility of the region or a peculiarity of the homomeric assembly of the channel. Here we report the architecture and homo-hexameric assembly of SWELL1 channels. Electrophysiological analyses presented here demonstrate that the homomeric SWELL1 structure retains properties of more complex heteromers, as mutations based on the structure proved to be relevant for VRAC currents in a cellular context. The structure of SWELL1 also provides hints as to how VRAC gating is regulated. Since decreases in intracellular ionic strength cause activation (Syeda et al., 2016), gating would likely be initiated by movement of intracellular domains in response to changes in salt concentration. We speculate that the multitude of charge-mediated interactions in the LRRs endows the SWELL1 structure with ionic-strength sensitivity, and via interactions with the N-terminus, the ILDs couple LRR movement to the transmembrane channel. Knock-out of LRRC8 genes in HeLa and suspension Freestyle HEK293-F cell line was completed using CRISPR/Cas9-mediated gene disruption (Ran et al., 2013). SWELL1 (LRRC8A), LRRC8B, LRRC8D, and LRRC8E genes were targeted using guideRNA (gRNA) sequences reported by Voss et al. (2014); the LRRC8C gene was targeted with a gRNA sequence reported by Syeda et al. (2016). Cloning of the gRNAs into PX458-mCherry plasmid was completed as reported in Syeda et al. (2016). Multiple plasmids were transfected simultaneously using either Lipofectamine 2000 or PEI max. After 48–72 hr, fluorescent mCherry positive cells were single-cell sorted into 96-well plates. Successful knock-out was determined by genotyping targeted regions for frameshift mutations and verified by mass spectrometry analysis. For HeLa cells (LRRC8-/- HeLa cells), complete knock-out was verified for all five LRRC8 genes. For HEK293-F suspension cells, complete knock-out was verified for LRRC8B-E (LRRC8(B,C,D,E)-/- HEK293-F cells). One SWELL1 allele remained intact in all surviving suspension culture lines. All cell lines tested negative for mycoplasma contamination. Human SWELL1 (LRRC8A) (Origene #RC208632) was cloned with a C-terminal FLAG-tag (DYKDDDDK) separated by a triple glycine linker (SWELL1-GGG-FLAG) into a pcDNA3.1/Zeo(-) vector using Gibson cloning. HEK293-F LRRC8(B,C,D,E)-/- cells were transfected at a cell density of 1.8*10^6 cells/mL with 1 mg/L cells of SWELL1-GGG-FLAG plasmid DNA combined with 3 mg/L cells of PEI max. After 48 hr, cells were pelleted and solubilized in solubilization buffer (20 mM Tris pH 8, 150 mM NaCl, 1% DMNG, 2 mg/mL iodoacetamide, and EDTA-free protease inhibitor cocktail (PIC)) at 4°C with vigorous shaking. The cell lysate was ultracentrifuged at 90,000 x g for 30 min at 4°C and the supernatant was collected and combined with 1 mL/L cells of FLAG M2 affinity resin for 1 hr batch incubation at 4°C with gentle shaking. Resin was washed in a gravity column with 5 mL per mL of resin (column volumes; CV) of solubilization buffer (20 mM Tris pH 8, 150 mM NaCl, 1% DMNG, 2 mg/mL iodoacetamide, and EDTA-free PIC), 5CV of high salt wash buffer (20 mM Tris pH 8, 150 mM NaCl, 0.05% digitonin, and EDTA-free PIC), and 10CV of wash buffer (20 mM Tris pH 8, 150 mM NaCl, 0.05% digitonin, and EDTA-free PIC). Protein was eluted using elution buffer (20 mM Tris pH 8, 150 mM NaCl, 0.05% digitonin, EDTA-free PIC and 3x FLAG peptide (Sigma or in-house peptide production)). Sample was concentrated and injected onto Shimadzu HPLC and separated using a Superose 6 Increase column equilibrated with running buffer (20 mM Tris pH 8, 150 mM NaCl, 0.05% digitonin, and EDTA-free PIC). The peak corresponding to SWELL1 homomeric oligomers (~800 kDa) was collected and used for cryo-EM grid preparation. The sample was concentrated to ~8 mg/mL using 100 kDa MWCO concentrators. Protein (3 μl) was applied to plasma cleaned UltrAuFoil 1.2/1.3 300 mesh grids, blotted for 6 s with 0 blot force, and plunge frozen into nitrogen cooled liquid ethane using a Vitrobot Mark IV (ThermoFisher). Images were collected at 200 kV on a Talos Arctica electron microscope (ThermoFisher) with a K2 direct electron detector (Gatan) at a nominal pixel size of 1.15 Å. Leginon software was used to automatically collect micrographs (Suloway et al., 2005). The total accumulated dose was ~55 e-/Å2 and the defocus range was 0.8–1.5 µm. Movies were aligned and dose-weighted using MotionCor2 (Zheng et al., 2017). Images were assessed for quality and edges of gold holes were masked using EMHP (Berndsen et al., 2017). CTF values were estimated using Gctf (Zhang, 2016). Template-based particle picking was completed using FindEM template correlator (Roseman, 2004). Particles were extracted using Relion 2.1 (Scheres, 2012) then subjected to 2D classification using cryoSPARC (Punjani et al., 2017). 130,054 particles corresponding to good 2D class averages were selected for further data processing. An ab initio initial model was created in cryoSPARC followed by iterative angular reconstitution and reconstruction. The resulting density map was used as a seed for refinement of the data set in Relion 2.1. Resolution of the resulting map was 4.6 Å. The map showed significant disorder in the LRR regions; however the map reveals that LRR regions arrange pairwise around a three-fold symmetry axis. As the transmembrane and extracellular domains were well-resolved, refinement was pursued imposing C3 symmetry and introducing a mask that excluded density outside of the well-defined, three-fold symmetric transmembrane/extracellular domains. Resolution of the resulting map was 4.0 Å; transmembrane/extracellular domains were well-resolved whereas LRR regions were largely disordered. This map was then used to create suitable projections that were subtracted from particles, thereby creating a particle data set corresponding mostly to LRR densities. This new data set was then subjected to 3D classification in Relion 2.1 (K-means split of 12). One of the resulting classes showed order in the pairwise LRR arrangement around the three-fold symmetry axis. Particles corresponding to this class (25,719) were then refined locally around the previously obtained coordinate assignment imposing three-fold symmetry resulting in an LRR density map at 5.0 Å resolution. Additionally – due to the overall higher degree of order – original particles corresponding to the 25,719 density-subtracted particles were refined under three-fold symmetry constraints. Resolution of the resulting map was 4.4 Å. An initial model of an N-terminal portion of SWELL1 was generated with RobettaCM using innexin-6 (5H1Q) as a template structure (Oshima et al., 2016; Song et al., 2013). The SWELL1 topology was predicted using OCTOPUS (Viklund and Elofsson, 2008). Predicted transmembrane regions were manually aligned to the transmembrane helices of the template structure 5H1Q (Oshima et al., 2016). Intervening regions of SWELL1 were aligned to 5H1Q using BLASTp. 10,000 independent homology models were generated with RosettaCM and clustered using Calibur (Li and Ng, 2010). The resulting model with the lowest Rosetta energy from the largest cluster was used as a guide for ab initio building of the transmembrane helices, extracellular domains, and intracellular linker domain. Sequence register was aided by bulky side chains and disulfide bonds in the extracellular domain. A Robetta-generated model of the SWELL1 LRR domain was docked into the EM density corresponding to the LRR of the outer subunit, which was better resolved than the inner subunit (Kim et al., 2004). This LRR model was adjusted manually to fit the density, then copied and docked into the LRR density of the inner subunit, followed by further adjustments. During the building process, manual building in COOT (Emsley and Cowtan, 2004) was iterated with real space refinement using Phenix (Adams et al., 2010) or RosettaRelax (DiMaio et al., 2009). Structures were evaluated using EMRinger (Barad et al., 2015) and MolProbity (Chen et al., 2010). The final model contains residues 15–68, 94–174, 232–802 in the inner subunit and 15–68, 94–175, 214–802 in the outer subunit. 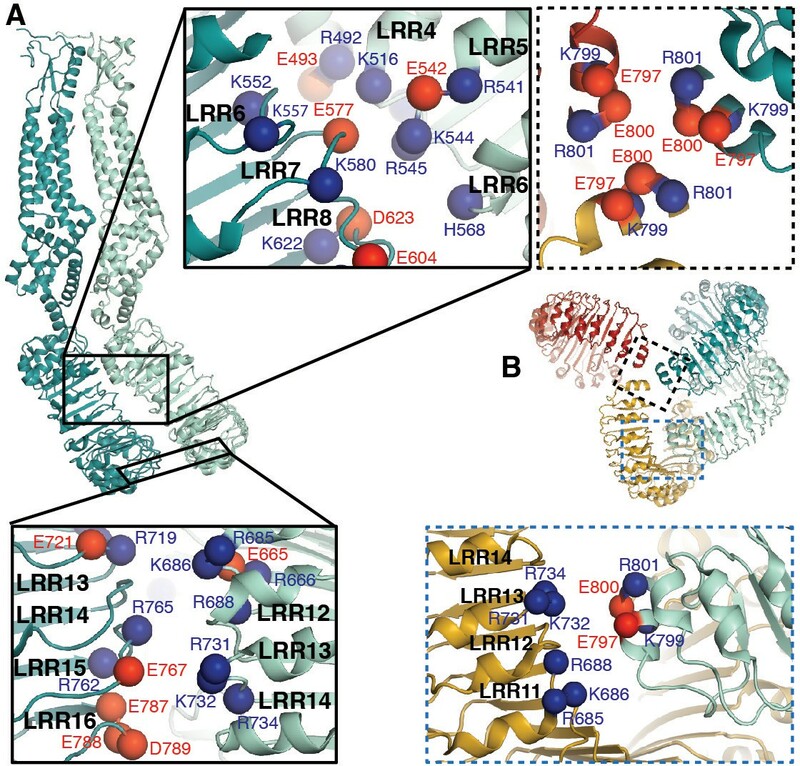 Side chains of residues 15–21, 359–364, 787–802 of both subunits and 214–233 of the outer subunit were trimmed to Cβ because of limited resolution and lack of well-defined secondary structures in these regions. Structure figures were made in Pymol (Schrodinger,, 2017) and UCSF Chimera (Pettersen et al., 2004). Pore radii were calculated using HOLE (Smart et al., 1996). The APBS plugin in pymol was used to calculate surface representations of electrostatic potentials. Electrophysiology experiments were completed with HeLa LRRC8-/- cells. HeLa LRRC8-/- cells were transfected 1–3 days earlier with SWELL1 constructs together with LRRC8C-ires-GFP in a 2:1 ratio (0.8 and 0.4 γ/ml for each coverslip). VRAC currents using a 2:1 ratio of SWELL1:LRRC8C were at least twice as large as those using a 1:1 ratio (data not shown). Only one cell per coverslip was tested for its response to hypotonic solution. In experiments aimed at determining whether HeLa LRRC8-/- cells transfected with SWELL1 only could express VRAC currents, the extracellular solution contained (in mM) 90 NaCl, 2 KCl, 1 MgCl2, 1 CaCl2, 10 HEPES, 110 mannitol (isotonic, 300 mOsm/kg) or 30 mannitol (hypotonic, 230mOsm/kg), pH 7.4 with NaOH; recording pipettes were filled with intracellular solution containing (in mM): 133 CsCl, 5 EGTA, 2 CaCl2, 1 MgCl2, 10 HEPES, 4 Mg-ATP, 0.5 Na-GTP (pH 7.3 with CsOH; 106 nM free Ca2+) and had resistances of 2–3 MΩ. Experiments testing R103F and T5 mutants used extracellular solutions described in Qiu et al. (2014) (‘bianionic’) and intracellular solution used in Syeda et al. (2016) (130 mM CsCl, 10 HEPES, 4 Mg-ATP, pH 7.3). These were used to determine relative permeability PI/PCl. An agar bridge was used between the ground electrode and the bath in all experiments. The Journal of General Physiology 103:153–179. Journal of Molecular Biology 392:181–190. The Journal of Physiology 592:4855–4862. The Journal of General Physiology 105:661–676. Journal of Cell Science 121:2744–2750. Progress in Biophysics and Molecular Biology 68:69–119. Pflügers Archiv - European Journal of Physiology 468:371–383. Journal of Structural Biology 145:91–99. Journal of Clinical Investigation 112:1707–1713. The PyMOL molecular graphics system, http://www.pymol.org/. American Journal of Physiology-Cell Physiology 271:C1872–C1878. Journal of Biological Chemistry 291:17040–17048. Thank you for submitting your article "Structure of the Human Volume Regulated Anion Channel" for consideration by eLife. Your article has been reviewed by three peer reviewers, and the evaluation has been overseen by Kenton Swartz as the Reviewing Editor and Richard Aldrich as the Senior Editor. The following individual involved in review of your submission has agreed to reveal his identity: Joseph A Mindell (Reviewer #3). This manuscript presents a cryo-EM-derived structure of a SWELL1 ion channel, which provides key information about the SWELL, or LRRC8, volume-regulated anion channels. The structure presented here is of a SWELL1 (LRRC8A) homohexamer; though this is not the biological form of the channel, which needs contributions from other subunits, this protein does form functional volume-regulated channels in both lipid bilayers (previously published) and in HeLa cells lacking the native VRAC. The hexameric structure presented here is noted to be related to the known connexins and innexins, which also form hexameric, large-pore channels. A notable feature of the assembly is a symmetry mismatch between the transmembrane and cytoplasmic domains – where the TMs are in a sixfold arrangement, the cytoplasmic domains form a trimer of dimers. A notable feature in the structure is a narrowing due to a loop on the extracellular face. Mutations to the arginine residue at this location diminish the anion selectivity of the channel, consistent with a role in ion selectivity. The work is generally clearly presented and represents an important early point in the understanding of this fairly new family of ion channels. The quality of the data is generally high, but there are few issues regarding reproducibility and interpretation that must be addressed. 1) Have you tried or considered using symmetry expansion as described in these studies? 2) The resolution map in Figure 1E shows resolution in the 4-5 Å range in the LRR domain (with the periphery becoming slightly worse). However, the LRR regions shown in Figure 1—figure supplement 4 appear to be less well resolved than suggested by the resolution map. Given that analysis of the LRR interfaces (a major part of the study) relies on this part of the map, additional metrics of map vs. model correlation would bolster reader confidence in the model analysis. 3) The presumed lipid, cholesterol or detergent densities should be shown in the context of the cryo-EM map (i.e. not solely with the molecular model as in Figure 3—figure supplement 1C). This will help the reader to assess the strength of these densities. 4) We disagree with the authors on their interpretation of the mutation at the TM subunit interface (main text, fifth paragraph, Figure 3—figure supplement 1). First, the mutation does not produce a "constitutively activated" channel. Rather it seems to introduce some kind of leak in the closed state; the data shown in Figure 3—figure supplement 1B for the mutant show robust activation by hypo-osmolality, albeit somewhat reduced from the wild type. There is not enough here to make a compelling argument about the role of Y127 in stabilizing the channel. In addition, the inhibition by DCPIB shown in panel C of that figure is described as having been repeated in one other cell. In general, the statistics and reproducibility information presented in the paper are excellent. This is an exception – even this control should at least be repeated in biological replicate to confirm the result. Given the lack of insight provided by the 127C mutation in general, the paper would be well served to have this figure simply removed. 5) Similarly, the T5 electrophysiology data in Figure 4—figure supplement 2 lacks any information about reproducibility or statistics. These must be added if this supplement will be included in the final paper. We thank the reviewers for their suggestion. Using the methods in Zhou, et al., (2015) as a model, we attempted symmetry expansion on the LRR dimer alone. Unfortunately, this did not improve resolution in this region, which is consistent with a certain level of continuous heterogeneity that prevented convergence at high resolution. We acknowledge the reviewers’ concern that the resolution in the LRR domains is limited due to flexibility. To increase confidence that the quality of the map in this region is resolved to ~5 Å, we include an additional panel in Figure 1—figure supplement 4 demonstrating beta-strand separation between LRR4-8. We agree that the resolution at the interfaces of the LRRs is not sufficient to build side chain densities, but we argue that the canonical fold of the LRR domains with hydrophobic residues internal to the solenoid give us confidence that the residues assigned to the loops between the alpha helix and beta strand of each repeat are accurate to the extent of the data. As such, all side chains in these regions have been trimmed to carbon beta atoms to prevent over-interpretation of the model. Additionally, we report separate EMRinger scores and map-model cross correlation for the entire model (Swell1), the pore-forming domains, and the LRR domains in Supplementary file 1. This figure supplement has been removed in the resubmitted text. Please see response to essential revision #4. We agree with the reviewers that Y127C might not have constitutive activity. Our intention was to convey that currents mediated by SWELL1-Y127C subunit together with endogenous non-LRRC8A subunits are observed as soon as whole cell recordings are initiated (HeLa shA KD cells expressing shRNA against LRRC8A (Qiu et al., 2014)). We think it is likely that these channels are more easily activated under our experimental conditions than wildtype channels, but our current dataset does not allow conclusions about mechanism. Since we do not at this time have a compelling argument to state anything mechanistic about the role of this mutation, we have removed this supplemental figure and associated text from the resubmitted manuscript. Figure 4—figure supplement 2 contains representative traces to support the data shown in Figure 4G and H. The title of Figure 4—figure supplement 2 was changed to “Representative data from cells expressing mutations in SWELL1 at T5 in the unresolved N-terminal region in heteromeric VRAC” to clarify that these panels contain example traces. Also, additional experiments were added to panels G and H in Figure 4 allowing statistical significance for each condition to be demonstrated. We thank H Turner, W Anderson, C Bowman, T Nieusma, R Hoffman, and L Kubalek for training in electron microscopy and computational methods. We acknowledge A Coombs for molecular biology assistance. We acknowledge P Dawson and P Cistrone for assistance in the production of 3x FLAG peptide reagent, and B Seegers for assistance with FACS for the development of CRIPSR cell lines. We thank R MacKinnon, G Lander, S Murthy and members of the Ward and Patapoutian labs for helpful discussions. This work was supported by National Institutes of Health (NIH) National Research Service Award F31 NS093778 to JMK, a Ray Thomas Edwards Foundation grant to ABW, and NIH grant NS083174 to AP. AP is an investigator of Howard Hughes Medical Institute (HHMI). © 2018, Kefauver et al.